Professional karaoke machines are not the typical small all in one setups you see in people’s homes or at kid’s parties. A professional karaoke machine is a component-based setup – it’s essentially a high quality receiver. These rigs are typically meant for karaoke bars, large venues, big tailgates, and so on. Pro karaoke machines might come with integrated screens although that isn’t a standard and you will find that most of them do not include a screen. A pro setup will come with high powered speakers that are designed to kick out crystal clear audio into a large area. You will find that pro karaoke machines are versatile and incredibly powerful. You can use them as stand-in amps for your guitar, theatre speakers for your movie or a PA system. And of course they are awesome for what they were designed to do – provide karaoke fun. The cheapest pro setups will cost you around $400 – higher end models are more probably around $1,000 or more price range. What then, should you consider when looking to buy a professional karaoke machine? When you are selling out your hard earned cash for a professional karaoke machine you want to make sure you are getting the best kit possible. You want your new professional karaoke machine to do absolutely everything for you. And that is just naming a few potential use cases. A good idea is list every single use case for your future karaoke machine / audio providing equipment. This way you will be certain to find the best professional karaoke machine that suits your needs both present and future. 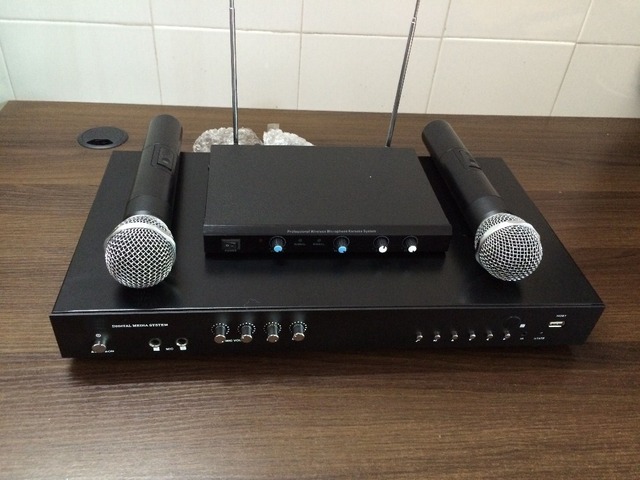 Professional karaoke machines will feature lots of different video inputs and outputs. The reason that a lot of professional karaoke machines won’t come with integrated screens is because they’re meant to be part of larger A/V systems. Make sure when choosing a professional karaoke machine that the unit you pick is compatible with any and all TVs, monitors, and projects you might want to use the machine with. Regarding machine controls, the price point – in general – dictates how many controls you have on your karaoke machine. The price tag also influences how specific those controls are as well. You should be able to find the types of controls you want and what you want them to do – as long as you are willing to pay for it. Most professional venues have recording and playback built into their entertainment systems. With recording you can run team karaoke contests, maintain leader boards for the contests or use it for your regular patrons. You will pay extra for high-fidelity, long-term recording and storage features. However if you want to establish your venue as a go-to entertainment stop it’s well worth the extra cost. The best professional karaoke machines come with a whole host of granular audio enhancement options as well as physical controls. Key changing – This allows for synthetically shifting the key of a voice giving tons of vocal possibilities during performances. Pitch control – A pitch control feature can make men sound like women and vice versa. Treble and bass – These are “equalizing” controls that afford you a lot of control over the quality of the audio running through your professional karaoke setup. Remember that in general, the more you spend the more bells and whistles you will have. If you keep the above in mind you are sure to find the best professional karaoke machine for your needs and venue.